Our training philosophy is very simple. Have fun doing what we love, while making certain you have a dog you can love life with. We created the #everywheredogs movement to embody our lifestyle goal for you; to have a dog that you can take everywhere you want, and actually enjoy your time together. We have training programs for all breeds and ages, from mild behavior issues to the most severe dog and human aggression. A result of our experience in raising and training working dogs as well as rehabilitating the truly behaviorally-challenged, we have created our EveryWherePups™ program. It incorporates all of the information you need to know to successfully raise your puppy, in the manner that best suits YOUR dog. We took a good hard look at the training industry and created our programs based on the results we work so hard to achieve with your dog, while addressing what we feel are shortcomings in the classic obedience models of pet trainers and big box stores. Our EveryWhereDogs Foundational program is best suited for adult dogs with minor behavioral problems, poor leash manners, over-excitement, or maybe you’re just looking for more reliability. Beginning with the walk, our goal is to teach your dog to have basic manners, how to be calm when you ask for it, and to teach you how you can better enjoy life with your dog. Obedience skills learned include a structured heel, place command (calm in the house), down, recall, and advanced obedience upon request. We believe in the ability for dogs to have dramatic changes in their often, very poor behavior. Our True Behavior Rehabilitation™ approach incorporates our ability to teach people a healthier way to live with their dogs, while respecting dogs as individuals and teaching the dog the rules and structure necessary to be successful members in your home. If you and your dog are struggling with leash reactivity, leash aggression, dog aggression, human aggression, or anxiety - this program will change your life with your dog. We are committed to rehabilitating your dog and, more importantly, helping you transform your life so you no longer have to be worried or anxious about having friends and family over, going out in public with your dog, or rearranging your life to suit their needs. The commitment does not end when we bring your dog home to you on your last go-home session. You and your dog will have access to unlimited EveryWhereDogs group walks, multiple times per month. We are here for you months and years from now. 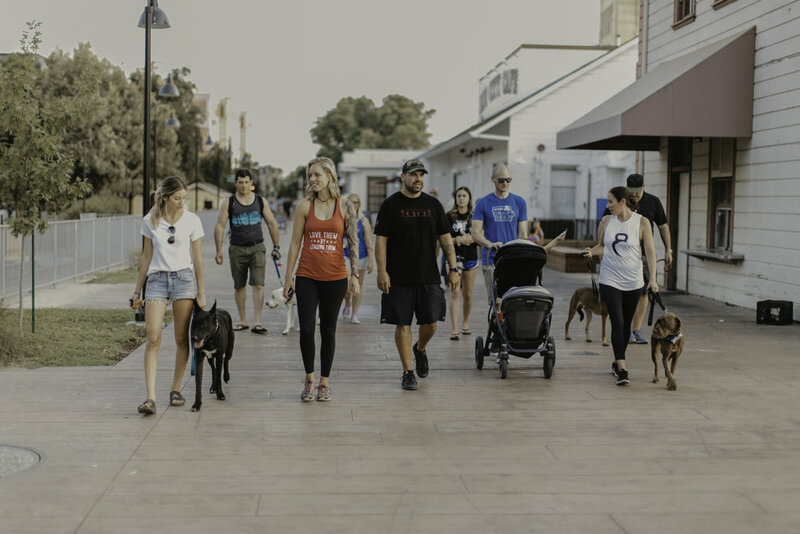 Our biggest commitment to you as owners, and what sets us apart from other local training programs, is Unlimited for Life access to our EveryWhereDogs group walks, that are scheduled multiple times per month. Each of our training programs includes our After Care, and are all centered around one concept - ensuring owners are able to develop the simple skills and mindset necessary to live a stress free, enjoyable life with their dog for years to come. Our Working Dog program sets us apart from other dog trainers. Why? Because we’re the best at navigating both worlds. We raise, train and often have for sale, a range of working dogs. Several of our most recent projects are working for Law Enforcement agencies, in addition to others that are Family Protection Dogs. We would love the opportunity to speak further with you about the services we provide and figure out together, which program would be the best fit for you, your dog, and your goals. Thank you for taking the time to complete the contact form! We will get back to you within 48 hrs via email with a few days and times to set up a phone consultation so we can hear more about you and your dog. who is gold hill canine? Our social media platforms give you an inside view of who we are, who our clients are, and what our training philosophy is like. Follow along for lots of laughs and valuable dog training and life info.